Such a great place to train! Quality instruction by teachers who truly are the best around! I have been looking for such a facility for a couple years, and I’m so grateful I found The Cellar!! You guys ROCK! Muay Thai, translated to English as “Thai Boxing”, is the National sport of Thailand. It is also referred to as the “Art of Eight Limbs” because, unlike Western Boxing which only uses two fists, Muay Thai involves using one’s punches, kicks, elbows, and knees to create eight points of contact. Muay thai also differs from the other striking arts of kickboxing and boxing by utilizing many different clinching techniques to create openings for all the eight weapons. Students of Muay Thai at The Cellar Gym will move up through the ranks developed by the World Thai Boxing Association and Ajarn Surachai “Chai” Sirisute. Once a member has reached an appropriate level, they will be invited to join advanced classes which are ideal for students who have an interest in competing Muay Thai or training MMA. Not interested in competing? It is also a great class to take if you have an interest in learning self-defense, coordination, or to shake up your fitness routine! In class, students will learn proper striking technique as well as blocking, movement and timing all while getting a great work out! You’ll Never Have the Same Class Twice! Our Muay Thai program is instructed by Chris Cichon and Ben Locken. Chris Cichon, is a kickboxing World Champion, Team USA member, and UFC trainer. Chris has won 3x World Titles under the International Kickboxing Federation and has international fight experience as a member of Team USA in Poland, Italy, Ireland, England, and Canada. Chris is the striking coach for UFC Veteran, Marcus LeVesseur and has produced several kickboxing and Muay Thai champion students. Chris is also a regular instructor for many of the kickboxing classes and boxing classes at The Cellar. Ben Locken is a Professional Mixed Martial artist with a combined 15 fights in kickboxing and MMA. 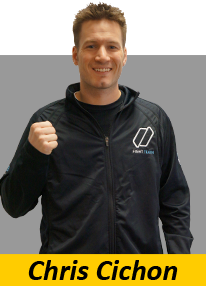 In addition to being a seasoned fighter, Ben has over 7 years of experience as a personal trainer and has worked with UFC veterans, professional fighters, top BJJ black belts, and Minneapolis Police Officers. In 2016, Ben earned his Apprentice Instructor Black belt in Muay Thai under Ajarn Chai and the World Thai Boxing Association. For those who have not heard of Cichon, he is a stand-up fighting wizard who runs CELLAR FIGHT AND FITNESS. I was blown away watching Chris hold mitts/pads and discussing foot work, head movement and combinations. I have seen a lot of people hold mitts/pads in my time, but no one with the deep understanding and fluidity that I was seeing from Chris.